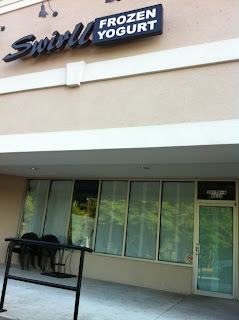 Texas-based Swirll frozen yogurt has closed their first of three Atlanta area locations. The chain, which entered the Atlanta market last year, was almost immediately put on my DeathWatch, and its closure comes as little surprise. Swirll dispenses YoCream, the frozen yogurt division of multinational corporation Danone whose U.S. headquarters are in White Plains, New York. Swirll's product seems altered. In my case, I walked in, had a sample, was terribly dissatisfied, and walked out. YoCream, as I've mentioned before, is the yogurt of choice for countless yogurt shops including Yogli Mogli and Menchies in addition to RaceTrac. The Swirll in the Roswell-Wieuca Shopping Center is the store that closed It was easily the worst located yogurt shop in metro Atlanta. I'm told the shop closed late last week, and that the remaining two locations in Perimeter Place and TOWN Brookhaven will remain open. The location, on the Wieuca Road side of the center anchored by The Fresh Market, offered zero visibility from Roswell Road, and would not be something you would really look for after turning onto Wieuca, from Roswell. Nearby, Three on The Tree from Clay Harper of Fellini's Pizza, closed shortly after Swirll opened, and has since been replaced by Ringside Franks and Shakes. Up the road at Tuxedo Festival, Menchies charges 44 cents per ounce (theoretically) for the same YoCream that Swirll was hawking for 45 cents per ounce. What is your favorite FroYo in town? Do you think something was awry at Swirll? Do you prefer yogurt by ounce or by size? Please share your thoughts in the comment section below. Best flavors & best prices - YOGURTLAND! I went to the Brookhaven location for the first time this week - I thought the flavors had an artificial taste. Also several of the yogurt metal handles were sticky - yuck. And 3 of the flavors were out of order. I tried just one of the toppings and it was stale. No plans for going back. Wish there were more Pinkberry's around. Always fresh and great tasting. Like it better than all the self-serv places around. YOGURTLAND, absolutely!! Just wish they had more locations. Hands down best price and quality.